This chapter presents the results of an examination of the current state of U.S. municipal wireless network design and policies with regards to people with disabilities. A survey and comparative analysis was undertaken of a sample of 48 municipalities to ascertain, (1) the accessibility of municipal wireless networks, and (2) the impact of external policy instruments, in this case the U.S. Department of Justice’s Project Civic Access (PCA), on network accessibility. Results suggest that the existence of external accessibility policy mechanisms, while positively associated with some sensitivity towards disadvantaged populations, does not seem to extend general awareness to individuals with disabilities. 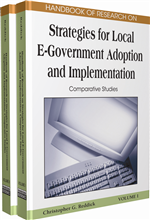 The authors conclude that although these cities have entered into accessibility compliance agreements, they are not necessarily going beyond the specific scope of the agreement, and they often overlook components of the “digital divide” within their communities. Information and communication technologies (ICTs) have become integral to almost every aspect of daily living and have transformed the ways in which users can interact with society at large. As society becomes more reliant upon ubiquitous high-speed information flows, the demand for faster, more powerful, and always-accessible broadband network connectivity is on the rise (“Wireless broadband,” 2006; Tapia, Maitland & Stone, 2006; U.S. FCC, 2007).1 The United States has experienced a significant increase in the number of broadband users in recent years, but it still lags behind other industrialized nations regarding the deployment of its broadband infrastructure (Turner, 2005; Wallsten, 2005).2 Government officials have begun to recognize the ability to access the Internet through broadband connections as a necessity for both citizens and the American economy (FTC Report, 2006). As a result, legislators and policymakers are supporting initiatives and plans to increase the number of Americans who are connected to the Internet. While a majority of U.S. homes have broadband Internet connectivity via cable or direct subscriber line (DSL) modem, wireless options are becoming more viable as a primary method for delivery of broadband services (Sirbu, Lehr & Gillett, 2006a; Sirbu, Lehr & Gillett, 2006b). As the U.S. Federal Communications Commission (FCC) (2005) noted, “Wireless broadband constitutes a critical component of our nation’s goal of ensuring that reliable and ubiquitous broadband becomes available for all Americans” (p. 13). Wireless technology also offers potential opportunities for individuals with disabilities by providing them the capability to access services and information that might otherwise be somewhat, if not completely, inaccessible. However, access may be limited by a general lack of awareness of technologies or accessible options, as well as economic, technological, and regulatory restrictions (GCATT, 2004). As of 2004, only 25% of people with disabilities owned a computer in comparison with 66% of individuals without disabilities. Also, only 20% of people with disabilities had access to the Internet, compared with 40% of their non-disabled counterparts (GCATT, 2004). For individuals with disabilities, equal access to information technologies and services, including wireless Internet, remains a major concern. Digital Divide: Term referring to the gap between those individuals with access to information and computing technologies and those without access, usually due to socioeconomic inequities or geographic disadvantages in that particular society. Municipal Wireless Network: Initiative undertaken by local governments to provide its citizens with universal broadband Internet access via wireless means, such as Wi-Fi technology. Such projects, as undertaken in the United States, are usually financed through partnerships between public and private interests to provide some form of subsidized Internet access. Section 508 Amendment: Law passed in 1998 amending the U.S. Rehabilitation Act of 1973 to require that all electronic and information technology developed or acquired by the federal government (including websites) be accessible for those with disabilities. Project Civic Access: Initiative by U.S. Department of Justice began in 1999, to provide means for amelioration, through settlement agreements, for those localities found to be in noncompliance with the Americans with Disabilities Act. Information and Communication Technology (ICT): Technologies utilized explicitly for the communication of information, particularly computers and telecommunications devices connected to other such devices via wired or wireless networks. Disability divide: Term derived from “digital divide,” which conceptualizes inequities in access to information technologies as the result of disability status.